Facebook data offers some information about users whose spouses attended the same high school or college. About 28% of married college-graduates attended the same college…. 12 of the top 25 colleges for women also make it into the top 25 for men…. 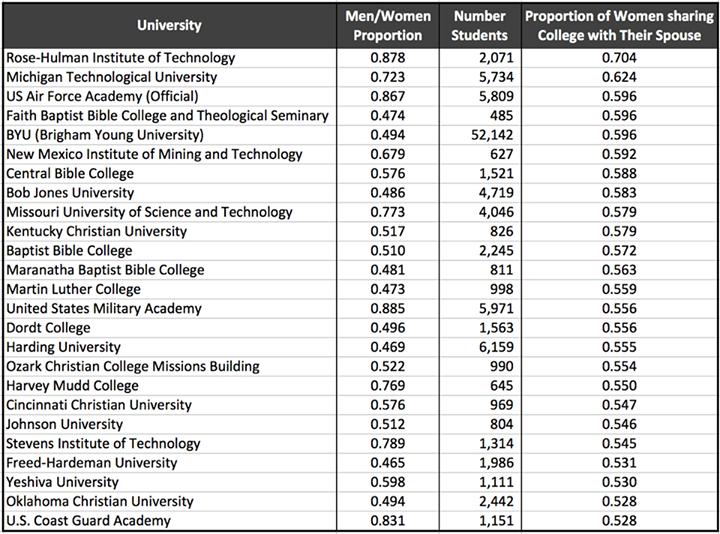 For Facebook women, the top schools for meeting future husbands are either affiliated with religion or specialize in STEM education. Some service academies also made the list. All this makes sense. For men, religious schools are the top ones for meeting future wives. Although this study has its limitations, it offers some insight that may be useful for those who want to find a spouse while in college. Susan Patton, the Princeton mother who advised women to “find a husband on campus before you graduate”, might agree. Keep in mind that the Internet has surpassed college as a way to meet marriage partners.